When it’s time to stock up for the winter, why not get all the nuts, fruit and seeds you will need for holiday baking, gifts or just plain snacking–and support our work at the same time? 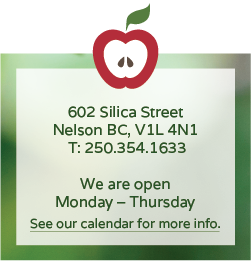 Rancho Vignola is a family-run business in Armstrong, BC that sells high-quality dried fruits, nuts, seeds and confections. The Nelson Food Cupboard partners with them each September to raise money so we are able to share their products, over the holidays, with the people who come to us for food. We do this by offering Rancho Vignola items to people at fair prices; orders are placed in September and available for pick up in November. The product list includes things like raw almonds and hazelnuts, roasted cashews and pistachios, pumpkin and sunflower seeds, dried apricots and cranberries, raisins, chocolate-covered almonds and more. Some items are organic. This initiative is a great way to support the Nelson Food Cupboard’s various programs. Click here to see the order form (as well as what’s available). 2017 orders are due September 26. To place your order before our deadline, ask for Kim Charlesworth, or any staff member, at 250 354-1633. You may also email Kim at: garden@foodcupboard.org for more info or to send in your order. Note that we must receive your payment before we place the actual order on the 26th. Customers will be contacted in early November after we get the goodies and are ready to redistribute.